International drag super star and acclaimed folk singer Trixie Mattel is about to paint the town….pink? RPDR super star to collaborate with cosmetics mega-brand Sugarpill for some seriously exclusive shades. After weeks of calculated teasing, California-based beauty brand Sugarpill has announced officially on Instagram that they have teamed up with the Rupaul’s Drag Race All Stars 3 Winner for some delicious shades. (See our chat with Trixie). “As a brand who believes in limitless self-expression through makeup,” Sugarpill said on Instagram, “teaming up with Trixie was a sparkly pink dream come true from heaven.” We couldn’t agree more. The collection will be available September 5th via the Sugarpill website. The company has long been teasing a collaboration with a fan favorite, however the only clue it would be Trixie were the clown and trophy emojis posted by the brand leading up to this morning’s news. Drag and makeup fans alike have been gunning for a drag-Trixie moment. The cosmetic brand, as many of you may know, is no stranger to the fandom of drag, and their past makeup collections speak volumes about their love of over-the-top color combinations and outrageous mugs. New Yorker and RPDR alum Kim Chi has already collaborated with the brand. Lelia McQueen and Farrah Moan are also both loyal Sugarpill fans. 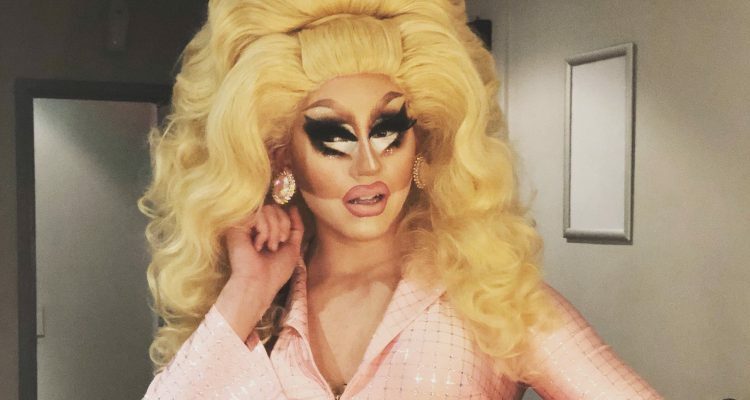 Trixie Mattel has become not only one of the most recognizable figures of drag, but she pretty much has a patented trademark on that excessively beat (but beautifully executed) face. No word yet on what shades we can expect or how many pieces the collection will have, however, knowing Trixie, it is safe to assume we can expect some pinks, honey.